NAR reported their February 2013 Existing Home Sales. Existing home sales increased 0.8% from last month and inventories increased to a still very tight 4.7 months of supply. Existing homes sales have increased 10.2% from a year ago. Volume was 4.98 million against January's 4.94 million, annualized existing home sales. 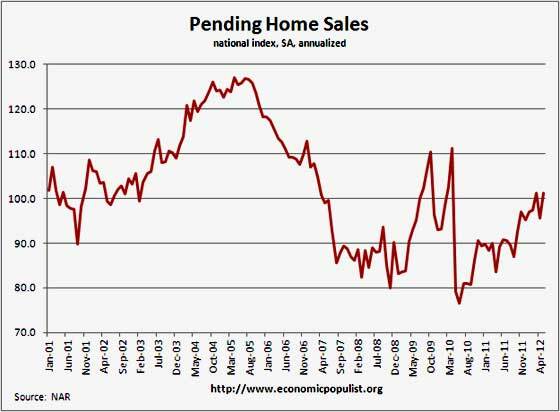 Pending Home Sales rose in November by 1.7%, annualized according to the National Association of Realtors. This is highest level since April 2010 to an index level of 106.4 and a 9.8% increase from a year ago. October pending home sales was revised down to 5.0% increase from September. NAR reported their September 2012 Existing Home Sales. Existing home sales decreased -1.7% from last month and inventories are down to a now tight 5.9 months of supply. Existing homes sales have increased 11.0% from a year ago. Volume was 4.75 million, annualized against August's revised up, from 4.82 to 4.83 million, annualized existing home sales. The NAR released their August 2012 Existing Home Sales. Existing home sales increased 7.8% from last month and inventories are down to a now tight 6.1 months of supply. Existing homes sales have increased 9.3% from a year ago. Volume was 4.82 million, annualized against July's 4.47 million annualized existing home sales. Existing home sales haven't been this strong since May 2010. The NAR released their July 2012 Existing Home Sales. Existing home sales increased 2.3% from last month and inventories are down to a measly 6.4 months of supply. Existing homes sales have increased 10.4% from July of last year. Volume was 4.47 million, annualized against June's 4.37 million annualized existing home sales. Pending Home Sales declined in June by -1.4%, annualized according to the National Association of Realtors. This is 9.5% higher than a year ago. May pending home sales was revised down to 5.4% from the originally reported 5.9% increase. The NAR released their June 2012 Existing Home Sales. Existing home sales plunged -5.4% and inventories ticked up to 6.6 months of supply. May existing home sales were revised to no change from April. Existing homes sales have increased 4.5% from June of last year. NAR reports pending home sales showed a 5.9% annualized monthly increase for May 2012. Realtytrac reports foreclosures are up in 54% of metro areas for Q1 2012. First quarter foreclosure activity increased from the previous quarter in 114 out of the nation’s 212 metropolitan areas with a population of 200,000 or more. First quarter foreclosure activity increased from the previous quarter in 26 out of the nation’s 50 largest metro areas, led by Pittsburgh (up 49 percent), Indianapolis (up 37 percent), Philadelphia (up 30 percent), New York (up 24 percent), Raleigh, N.C. (up 23 percent), and Virginia Beach, Va. (up 22 percent). The biggest quarterly decreases in foreclosure activity among the 50 largest metro areas were in Portland, Ore. (down 28 percent), Las Vegas (down 26 percent), Providence, R.I. (down 24 percent), Salt Lake City (down 22 percent), Boston (down 21 percent), and San Jose, Calif. (down 21 percent). Lender Processing also reported mortgage deliquencies are down -6.8% from February and are currently 7.09% of all mortgages. Since March 2011 delinquencies have declined -​8.8%. That said, foreclosure inventory is up 0.1% and stands at 2,060,000. That is a hell of a lot of foreclosures that need to be sold. For the year, foreclosure activity is down in 64% of metro areas. Lender Processing Services has released their January 2012 mortgage statistics. Foreclosure starts increased 27.9% and foreclosure sales surged 29% in January 2012. We predicted foreclosures would massively increase due to the 50 state mortgage fraud settlement.